*Our field trip reservation procedures have changed as of January 2018. Please read carefully. 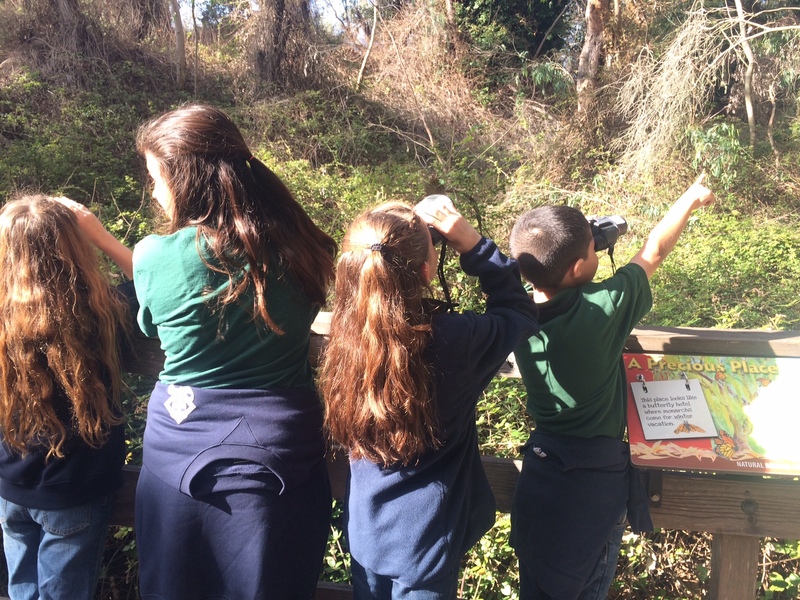 Students can explore and learn about diversity of habitats at Natural Bridges State Beach. Discover our three protected areas through tidepool tours of the Marine Protected Area, butterfly tours in our Monarch Butterfly Natural Preserve, and nature walks around the park including the Moore Creek Wetlands Natural Reserve. *School tours are free with a reservation at least 14 days in advance. A minimum donation of $1/person is suggested. Thank you letters for volunteer docents are greatly appreciated. Donations or thank you letters can be sent to Natural Bridges State Beach, c/o 2531 West Cliff Dr. Santa Cruz, CA 95060. Description: Monarch tours are available from October through January. This includes a 30-minute indoor program highlighting the monarch life cycle and migration followed by an experiential outdoor walk to the milkweed garden and butterfly sanctuary. The park begins accepting reservations for monarch tours on August 1. Monarch tours happen rain or shine. Description: Tidepool tours are available from approximately March 1 to July 30 each year. This program begins with a 30-minute tidepool introduction in the visitor center, followed by a guided walk and rocky intertidal zone exploration. Tides must be less than two feet to safely view the pools. Please refer to our online calendar to see what times are available and safe for tidepool tours. Non-slip shoes are recommended for tidepool tours. Shoes may get wet. Tidepool tours are cancelled in inclement weather for safety reasons. The park begins accepting reservations for tidepool tours on January 2. Description: When the monarchs have migrated inland or when the tides are not conducive to exploring the intertidal zone, Natural Bridges State Beach offers a guided nature walk. The walk follows a one mile trail that winds its way through a diversity of habitats. This program focuses on weathering, erosion, and the relationship between organisms and their environment. All tours with students (K-12th grade) require a ratio of at least one adult chaperone per seven children. If this is a hardship for your school please call (831) 423-4609 to discuss this with the staff. The maximum group size for all tours is 35, which includes both children and adults. Adult chaperones and teachers are in charge of discipline and first aid on tours. Up to four tours a day can be scheduled Monday through Friday. Check our Google Calendar for availability below. Times may vary based on tides and your scheduling needs. There is no charge for school tours. School groups grades K-12 who have made a reservation at least 14 days in advance will receive free parking passes in a confirmation packet. A minimum donation of $1/person to our non-profit association is requested. The donation provides funding for future educational tours and special events. Other groups (senior citizens, scouts, etc.) and individuals pay parking fees as follows: $10 per automobile, $50 per 10-24 passenger bus, $100 per 25-or-more-passenger bus. Please contact the visitor center for self-guided tours. Notifying us of your visit will help avoid over-impact on the tidepools and monarch preserve by limiting the number of groups visiting at one time. Restoration work provides a fantastic opportunity to lend a hand, and connect with the park and with nature. Students can help by watering plants, planting trees, and eradicating invasive flora. Length of restoration time can vary depending on the age and availability of the group. Collecting is not allowed in State Parks. Please leave all shells, rocks, sticks, animals, seaweed or anything else where it is. These things are part of what makes Natural Bridges a special place to visit. Dress in layers as the weather is variable. Picnic tables, water fountains and restrooms are available for use. Recycling bins are available. Please educate the group to help reduce waste. California State Parks offers a free distance-learning program that uses live video conferencing with a park interpreter to help schools teach academic content standards. Click here to learn more about the Parks Online Resources for Teachers & Students program (PORTS). *This calendar is updated when possible. Use these dates as a guideline; you are not guaranteed the date requested as we may be scheduling previously submitted requests. Always include alternative dates. Please click here to request a Natural Bridges State Beach school program.